Does your Payroll and HCM claim to be single source, but really just a tangled spiderweb of incompatible systems? Does dealing with their disconnected customer service send chills down your spine? Halloween may be fast approaching, but that doesn’t mean you deserve more tricks than treats when it comes to your payroll and HR administration. Don’t get trapped in another payroll companies’ web of deception or haunted house of customer service. With Netchex, your experience is sure to be less tricks and more treats — regardless of the time of year. Most of the larger payroll and HCM companies have grown by acquisition and merger, creating a monster mash-up of systems that are not truly single-source. Functions like time and attendance are handled by a completely different team than Payroll or Benefits — and they rarely communicate with one another effectively. When you have data input into one system, the data must then transfer to another via system feed, which is not always reliable. With Netchex, you are guaranteed a spellbinding true single-source technology. 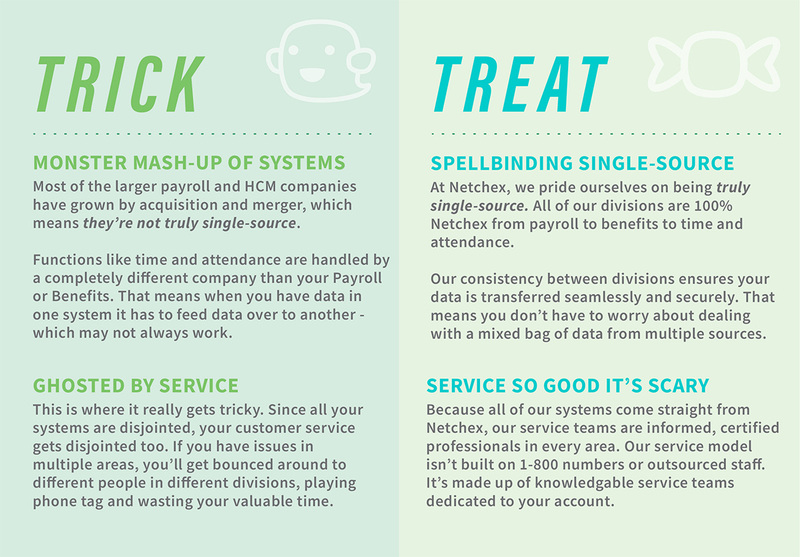 All our divisions are 100% Netchex — from payroll and time/attendance to benefits and HR administration. Our communication and consistency between divisions ensures your data is transferred seamlessly and securely. That means you don’t have to worry about dealing with a mixed bag of data and miscommunication from multiple sources. Same goes for customer service. When your systems are disjointed, your customer service gets disjointed as well. If you have issues in multiple areas, you’ll get bounced around to different people in different divisions, playing phone tag, wasting your valuable time, and making you feel ghosted by service. Because all of our systems come straight from Netchex, our dedicated service teams are informed, certified professionals in every area. Committed to bringing you service so good, it’s scary, our service model isn’t built on 1-800 numbers or outsourced staff—it’s made up of knowledgeable service teams dedicated to your account.